Hort. Kew. [W. Aiton] 1: 442 1789. 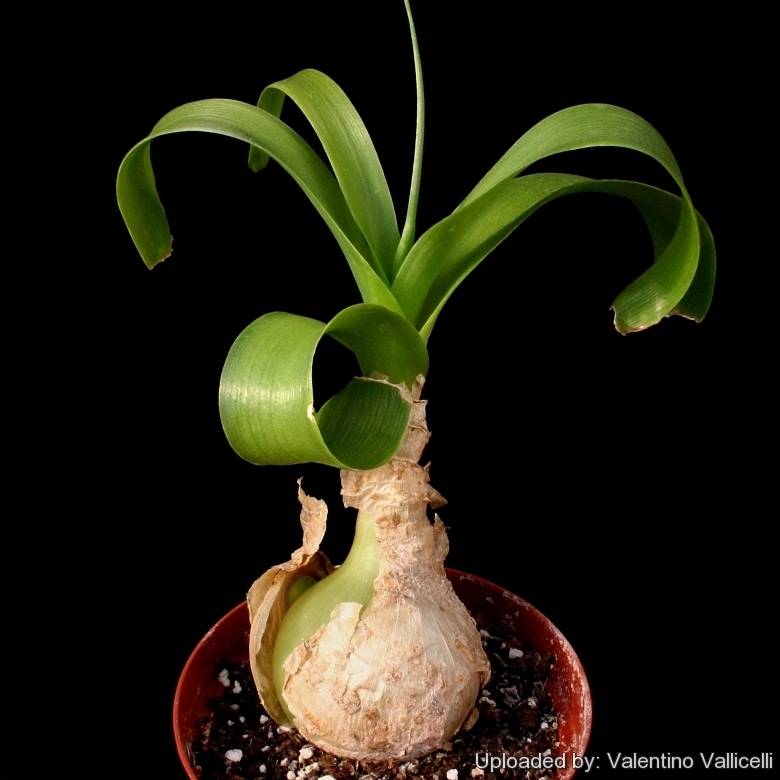 False Sea Onionis This is a rather curious bulbous plant and unlike an true onion however, the bulb grows above ground, reaching up to 10 cm in diameter. Incidentally, the “onions” are decidedly NON-edible! Origin and Habitat: Southern Cape coastal areas of South Africa to KwaZulu-Natal, where it also extends inland to the foothills of the Drakensberg, and widespread northwards into tropical East Africa. Altitude (min/max): 0/300 metres above sea level. Habitat and Ecology: Ornithogalum caudatum grows in warm moist habitats comprising Forest, Fynbos, Indian Ocean Coastal Belt and Savanna. This bulbs is often found in forest, forest margins, closed woodland and sheltered rock ledges. It is a widespread and common species that is not threatened. The population trend is stable. 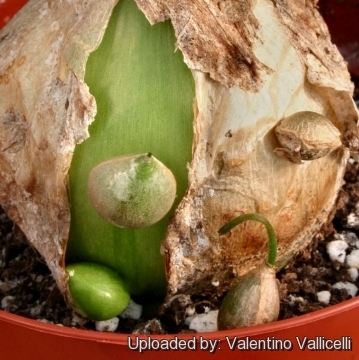 Description: Ornithogalum caudatum is (a.k.a. False Sea Onion) is an old name used to indicate one of the forms of the widespread and variable Albuca bracteata. The amount of phenotypic variation in the species has led in the past to the create several unnecessary names representing no more than local phenotypes. Ornithogalum caudatum, often mentioned in old literature and still often offered in plant lists, should be fully synonymized with Albuca bracteata. Inflorescences are spikes 70-90 cm tall, capped by small white fragrant flowers with green, central stripes, often produced in different seasons. 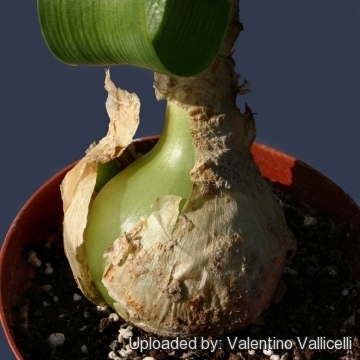 This bulb is better-known in cultivation as "Pregnant Onions". Derivation of specific name: Latin caudatum, “with a tail” in reference to the filiform bracts of the scape or maybe for the long strap-like leaves. Habit: Ornithogalum caudatum is a rather curious bulbous plant and looks very similar to an onion. 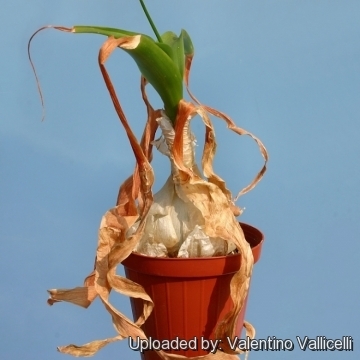 It a classic cryptophyte (with bulb-like stem) that dies back during the dry period of the Mediterranean climate. Bulbs: Sitting partially on top of the ground and cluster-forming, globose to ovoid, that and will reach 3-8 (-10) cm in diameter, smooth, tunics succulent, opalescent, pale apple-green, withering grey, exposing green live tissue. When larger produce bulbils on their sides. The pedicels of the numerous bulbils are unite with one another and with the face of the sheath of the succeding leaf. Leaves: 5–8(-12) synanthous (with flowers and leaves appearing at the same time), rosulate, bases sheathing, strap-like and tapering to a slender point, ascending to curving, semi-succulent, flaccid, channelled, growing very long under ideal circumstances (20-)30-60(-100) cm in length, 20-50 mm broad low down. The leaves wither from the apex and droop. Inflorescence (raceme): Peduncle (scape), terete, erect, moderately stout, stiffly erect, 45-90 cm long. Pedicels ascending, the lower about 5 mm long (lengthening to 15-18 mm in fruit); bracts subulate-setaceous (filiform), from a broadening lanceolate base, the lower 12-40 mm long, projecting beyond the buds. Raceme moderately dense, 15-30 cm long. There may be as many as 50 to 100(-300) flowers per stalk. Flowers: Small, fragrant, white, with green, central stripes. Perianth stellate, white 8-12 mm long; segments (tepals) oblong, linear-elliptic, to 9 mm long 2.5 mm broad, white, with a distinct green keel. Stamens 3/4 the length of the perianth; filaments alternately lanceolate and quadrate at the base; style 3-4 mm long. Ovary globose. Fruit (capsule): Globose to ovate trigonous, to10 mm long 6 mm in diameter. Seeds: Oblong, angular, 4 x 1.5 mm, not crowded nor compressed . Blooming Time: Usually flower from May to August. Chromosome number: Ornithogalum caudatum occours in different cytotypes 2n=54, 52. Albuca bracteata (Thunb.) J.C.Manning & Goldblatt: has green opalescent, exposed bulb with curious little bulblets, causing 'pregnant' looking bumps until the layer sloughs off to reveal the bulblets. Distribution: Suoth Africa, KwaZulu-Natal, and widespread northwards into tropical East Africa. Ornithogalum caudatum Aiton: same as Albuca bracteata? distribution. Suoth Africa, KwaZulu-Natal, and widespread northwards into tropical East Africa. Ornithogalum caudatum f. compact Kowie River: Compact form. Distribution: Kowie River. 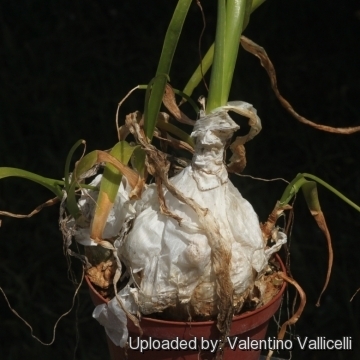 Notes: This plant is also known as the "Pregnant Onion". The pregnant part is owed to its strange distinction of producing babies on the bulb scales that are visible as small bumps on the surface. To show off the ‘pregnancies,’ occasionally remove the papery outer layers and drying leaves. 1) J. G. Baker. “Flora of Tropical Africa”, Vol 7, page 421, 1898. 2) J. G. Baker. “Flora Capensis” page 253, 1897. 4) Müller-Doblies, U. and Müller-Doblies, D. “Revisionula incompleta Ornithogalorum Austro-Africanorum (Hyacinthaceae).” Feddes Repertorium 107(5-6):361-548. 1996. 5) Obermeyer, A.A. ”Ornithogalum: a revision of the southern African species.” Bothalia 12(3):323-376. 1978. 6) von Staden, L. Albuca bracteata (Thunb.) J.C.Manning & Goldblatt. National Assessment: Red List of South African Plants version 2015.1. Accessed on 2015/12/06 2012. 13) Crouch & Symmonds “Toxicity ? fact or fancy ?” Plantlife 20: 27-29, 1999. 14) African Plants Database (version 3.4.0). Conservatoire et Jardin botaniques de la Ville de Genève and South African National Biodiversity Institute, Pretoria, "Retrieved 5 December 2015", from <http://www.ville-ge.ch/musinfo/bd/cjb/africa/>. Cultivation and Propagation: It is an easy and adaptable plant to grow and it is well suited for containers growing happily in a pot for many years. It makes a good but odd houseplant or specimen. Prefers some direct sun but will scorch in hot, sunny, dry locations. In the greenhouse, use a suffice cactus soil with some peat (a soil that retains water yet drains well). The plants are allowed to dry slightly in-between waterings. If the plants are allowed to dry too much, they will go dormant. During the winter months, the plants are allowed to go dormant and are stored in the cold storage until spring. Temperature: Reportedly hardy down to -5°C. Propagation: Division, seeds, offsets (bulbils). 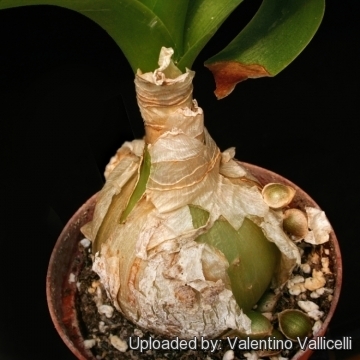 Produces somatic embryos (bulbils) on the bulb scale tissue, visible as small bumps (pregnancies) on the surface of overlying bulb scales in mature specimens. These eventually fall off when outer scale layers disintegrate or split. 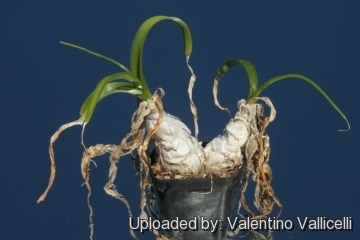 The bulblets then root and establish new plantlets. Copious seed is also produced and germinate easily. It is best to propagate seeds in the spring through summer in a mixture of moist peat and perlite. Cover the pot and plant with a plastic bag secured by a rubber band to prevent the moisture from escaping. Place in indirect sunlight or under a fluorescent light. Repot in its regular mix after it has been growing for a while. After dividing plant or removing offsets, pot it in its regular potting mix. Warning: Most parts of the plant are considered highly toxic. Dermatitis is common in some people who handle the plants. The size and attractiveness of the little bulblets may pose a choking danger to children. Ethnobotanical/Economic Uses: In its native habitat, crushed leaves are sometimes tied over cuts and bruises and said to have healing effects similar to aloe vera. Also used as cooked syrup with rock candy against colds.